Contemporary art focusing on mixed media paintings and sculpture in bronze and steel, ranging in size from pedestal to large outdoor commissions. "You have to come up with something that intrigues you and stimulates you, and challenges you enough to commit your life to doing this. The challenge has to be something that helps you to understand and accept life... and to be a better person. There is a revealing aspect to making art. That's what a lot of my process is about. The paintings are like collecting memories, and then creating a memory dialogue. It's a strange process. It has to be about more than just making objects or painting. It must be deeper. It is an involvement in life." Inspired by the redwoods of his childhood, Van Earl likens his work to a pinecone. While you may see a pinecone as a single solitary perfect shape, it is actually many parts that are all different and irregular to form something unique together. 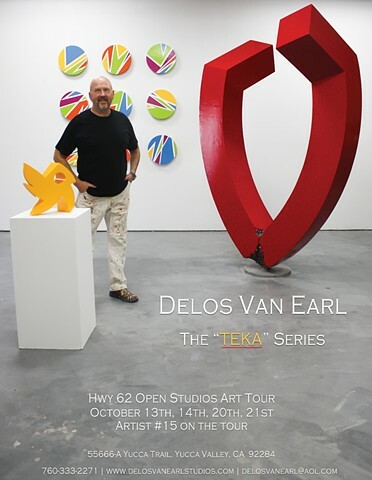 This process of revealing what is underneath, knowing how much paint to put on and how much to take off, is the balance Van Earl tries to achieve. His additive and reductive process blurs the line between painting and sculpture. "I identify these works, in a way, as 'intelligent design,' says Delos. "Everything is as it should be. Each element that I put into place creates a balance and tension as your eye moves from color to form and back. Putting it simply: Harmony." All art is produced at the Yucca Valley studios. Proudly Made In America.